My Big Fat Greek Coming Out Day! 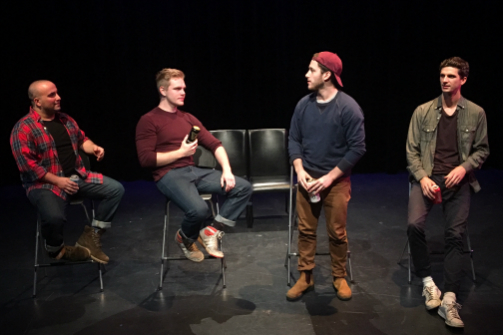 Yianni Papadimos, Bryce Dutton, Colin Parrinello, and Steven Meehan in The Dog Died: A Midwestern Case Study. BOTTOM LINE: This is not your typical "coming out" story, but a story about the people you come out to, and the fascinating ways that their lives change. The typical focus and arc of a play about “coming out” usually centers on the personal struggle of someone announcing their true sexual orientation to their loved ones. In The Dog Died: A Midwestern Case Study, playwright and actor Yianni Papadimos defiantly eschews this narrative, turning the spotlight away from his queer protagonist to focus instead upon the people greatly affected by this news, a perspective that is refreshing because it is true to life. After all, coming out can change many lives—romantic partners' hearts can be shattered, friends may struggle to adjust their vocabulary and political views, and families may feel betrayed because something so important has been kept a secret. When Alex (Yianni Papadimos) receives a call from his best friend Bart (Colin Parrinello) telling him that his dog has passed away, he’s understandably upset. Less about his dog, however, than because he found out from a friend, not a family member. Having recently come out, Alex suspects that his family has distanced themselves because of his sexual orientation, only to find out that there’s a lot his family doesn’t tell him. Not only did he not receive the funeral e-card, his conservative younger brother George (Steven Meehan) has been sleeping with Laura (Taylor Rae Almonte), his recent ex-girlfriend and current roommate. Papadimos’ writing excels in scenes of lightning-fast dialogue and witty comebacks. While Alex's friends Devin and Bart (played to perfection by Bryce Dutton and Colin Parrinello) are certainly excellent foils for Alex’s story, their own lives are also put on display; they make excellent arguments for proving that there’s nothing wrong with limiting their ambitions to suit their small town lives. As George, Meehan brilliantly manages to elicit considerable sympathy (as a conservative no less!) through his tender portrayal of someone who not only deeply loves his brother, but who is trying his hardest to adapt to the new rules and relationships of this ever-changing world. While much of the play is on point, there are moments of confusion and some lost opportunities. In presenting the play as a case study, there is no overarching objective, which means that some relationships remain underdeveloped, and tremendous buildup is often followed by little closure. The play moves quickly thanks to the seamless direction of Brendan Stackhouse, however slower moments of long monologues seem out of place, particularly when presented in a non-linear fashion. While it may benefit from further workshopping, there is no question that The Dog Died: A Midwestern Case Study has great potential and should see a promising life in future venues. (The Dog Died: A Midwestern Case Study played at Dixon Place, 161A Chrystie Street, on July 17, 2017. The running time was 75 minutes. Tickets were $15 ($18 at the door). For more information visit dixonplace.org. The Dog Died: A Midwestern Case Study is by Yianni Papadimos. Directed by Brendan Stackhouse. Stage Manager is Allison Newcombe. The cast is Taylor Rae Almonte, Bryce Dutton, Steven Meehan, Yianni Papadimos, and Colin Parrinello.